Mix the dry ingredients together in a bowl. In a stand up mixer, beat together the butter and sugar for a couple of minutes until fluffy, add the eggs one at the time and the lemon until blended. Add half of the dry ingredients on low speed, add the nuts and then the rest of the dry ingredients a little at the time. Form the dough into a long, wide log on a baking sheet. Bake until golden brown, about 40 minutes. Cool slightly until you can touch it. Place the log on a cutting board and cut into 3/4inch slices. 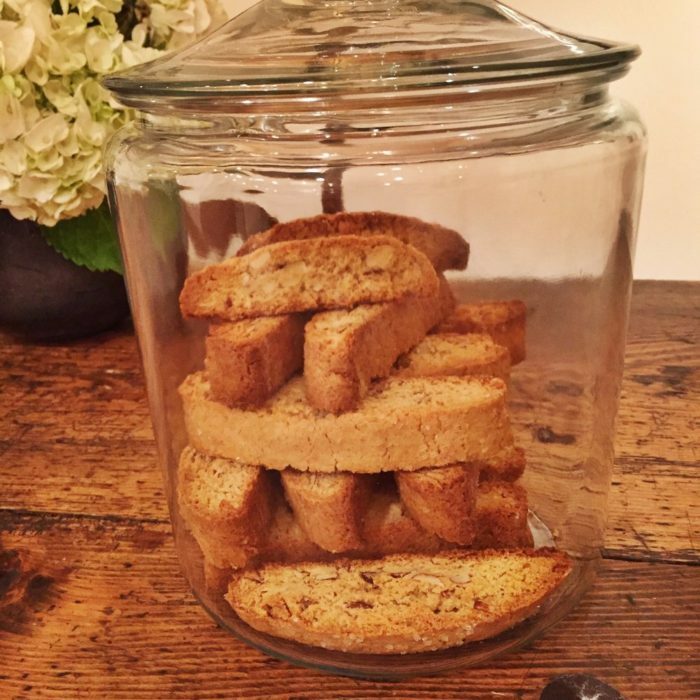 Arrange the biscotti side down back on the baking sheet and return to the oven for 15 minutes, turning over half way. Let them cool completely on a rack. This is my favorite biscuit! It goes so well with my hot chocolate. I loved this recipe for suggesting maple syrup instead of sugar, it’s amazing!